Lakshmi Lambert is a master herbalist, licensed acupuncturist, certified body/mind integrator, acupressure therapist, educator, and counselor, offering personalized health care for people of all ages. According to the American Holistic Health Association, Holistic Health is actually an approach to life. Rather than focusing on illness or specific parts of the body, this ancient approach to health considers the whole person and emphasizes the connection of mind, body, and spirit. It is my honor to guild you to become your most healthy, balanced, fully expressed self. I help each patient to feel connected to the rest of the world, help them know that they have something to contribute to the world, and help them feel more grounded and offer skills to regain grounding and a sense of connection to all. Adding to treatment I offer weekly an Expressive Movement Circle to enhance healing on Wednesdays from 7:30 – 9 PM. Diagnosing via traditional Chinese medicine, I treat physical and emotional health to guide my patients toward more healthy and empowered well being. With a specialty in Women’s Healthcare, I assist with the regulation of menses, calm premenstrual symptoms (PMS), enhance fertility, provide safe pregnancy care, turn breach fetus around if necessary, induce labor, provide postpartum care, increase milk production for nursing, support the transition into menopausal strength. Using Acupuncture and or Acupressure, Homeopathy, Deep Tissue Bodywork, Moxa, Cupping, Ear coning, Counseling, Corrective Exercises, and Herbal Medicine. I create the Herbal Formulas from my extensive herbal pharmacy, which are personalized for each patient and brewed as tea. The formula changes as the individual heals. I’ve been in human services all my life, from waitressing to teaching children. In the 1980’s I worked as a Dance Movement Therapist and Psychodramatist, individual & group therapist for Ulster County Mental Health. 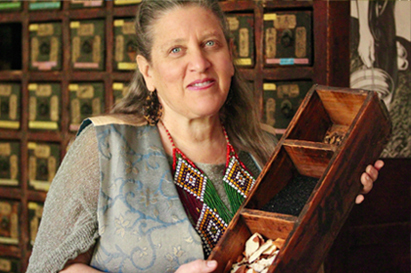 I began studying the Wise Woman Tradition of Western Herbal Medicine with Susan S. Weed in upstate New York. Coming to California in 1984, I graduated from the Bodymind Institute in 1986 as a certified Bodymind Integrator and certified Postural Integrator. I studied Acupressure at the Ryoho Institute and was hired on as staff. I graduated Emperor’s College of Traditional Chinese Medicine in 1989. I began studying Homeopathy in 1987, which is continuing source of study. 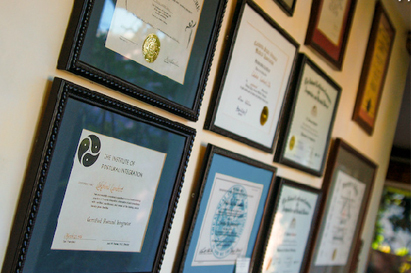 I graduated Los Angeles School of Homeopathy with is Diplomat of Homeopathy in 2010. Lakshmi Lambert is the closest thing to an angel that I have encountered. 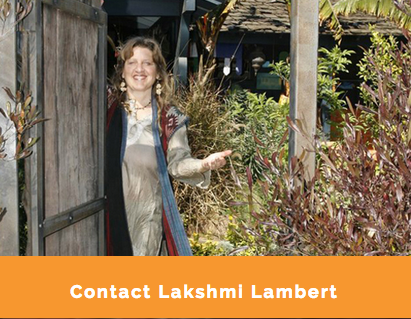 If you are looking for a true healer - someone who is completely devoted to bringing you to optimum health - emotionally & physically - then you should visit Lakshmi Lambert. Lakshmi Lambert provides a level of deep healing you will not find elsewhere. Throughout the years I've had numerous encounters with healers and their various modalities, some good, some great, some not so. Lakshmi combines knowledge, passion and wisdom while encouraging communication to achieve stunning results. I'm grateful for the opportunity to work with Lakshmi Lambert. Simply the best. Lakshmi Lambert is an absolute phenomenal holistic doctor. Her experience, patience, and insight have helped me time and time again. Totally recommend Lakshmi. The reason I was looking for accupuncture treatment was a back ache due to a lower disc hernia. My doctor gave me a referral. However, what I really found was somebody who took the time to get to know me and really help me through my recovery process. What began as a specific therapy has become a time of general wellness and illumination. Lakshmi is a unique person and will help you feel better, and be better. What an incredible healing Goddess is Lakshmi. I have been seeing Lakshmi for over 10 years and I am truly grateful for the healing she has guided me through. I would recommend Lakshmi to anyone looking for acupuncture and other holistic treatments.